The Grey Horse building was demolished c1850 and a large warehouse built on the site of the stables. In 1790 this Inn was owned by Daniel Neale, a Maltster, who mortgaged the Inn to Mary Dixon for £300. The principal sum was never repaid and Mary Dixon went into possession. She died in 1793 leaving the property to her grandson, John Dixon Cunliffe, who was Innkeeper until his death in 1843 when his children inherited the property. In 1844 one of his sons, William, was Innkeeper. He bought his siblings’ shares for £480 when the property was then conveyed to him. In 1848 he sold the Inn for £615 to Christopher Jackson, a grocer and tobacco manufacturer, who did not renew the Licence and the Grey Horse closed as an Inn in December 1849. 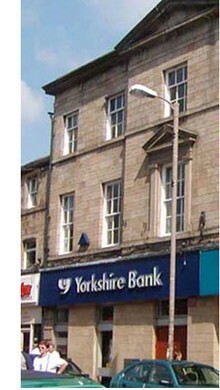 During 1909, the property was sold to Yorkshire Penny Bank and in 2011 is still occupied by what is now known as Yorkshire Bank.